You may, or may not be aware but World Gin Day is nearly upon us and we’re ready to celebrate on Saturday 10th June 2017! To coincide with this yearly event, we’ve got a great competition to win a pair of copa style Gin and Tonic glasses from Schott Zwiesel! These very popular Spanish style gin glasses offer the perfect Gin drinking experience and allow you to add lots of refreshing garnishes and plenty of ice so you can really enjoy your favourite Gin to the max! How do I enter the Wineware #worldginday Competition? The Wineware #WorldGinDay competition ends midnight 10/06/2017. We will contact the winner of the competition the week commencing 12th June 2017. I love Rock Rose gin with tonic, fresh strawberries and black pepper- delicious! Brockmans! I really like it with bitter lemon!! Bulldog gin with tonic and blood orange segments. Having recently discovered Gin I’m in the market for some glasses and these look just perfect. I quite like sloe gin and the best brand I’ve found so far is Sipsmith. I just add a little tonic to my gin. Hendricks and tonic on ice with cucumber please! 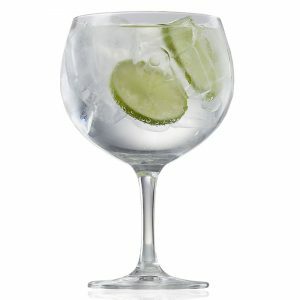 My favourite gin is Bombay Sapphire and I love to add Fever Tree tonic and a slice of lime. The glasses look amaz’GIN’!! ..I love Bombay Sapphire, with tonic and a slice of lime!!! cheers!! Bombay Sapphire with tonic, lots of crushed ice and a slice of lime! Gordons gin with ice and a slice of lime. For cocktails I like to add some cranberry juice. My favourite is Gordon’s Gin as I don’t drink a lot. Love a long cool gin with tonic & lemon. Hendricks with elderflower Fever Tree Tonic, sliced cucumber and lots of ice! I love trying all types of flavours when it comes to gin. Happy world gin day! Love bulldog gin. It’s dry but still palatable enough to drink on its own with ice.